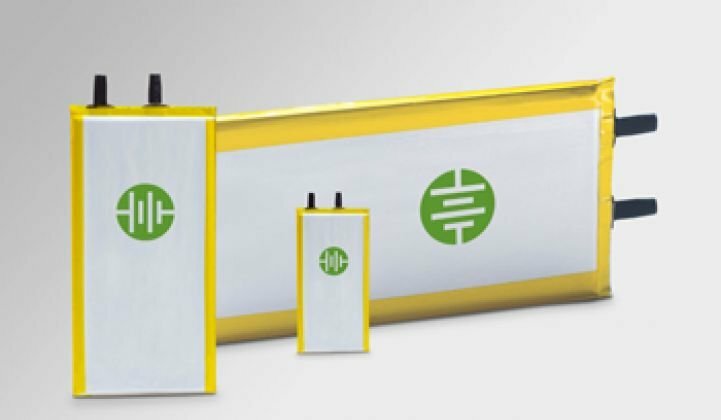 Leyden Energy, a consumer battery startup, just won a $10 million Round C financing from existing investors New Enterprise Associates, Lightspeed Ventures, Sigma Partners and Walden International. Battery startups can make performance claims about cost, cycle life, and energy density -- but innovating and scaling in battery technology is hard. Ask A123 or Imara or Firefly. Funding from premier VCs does not give engineers special privileges with the periodic table. On the other hand -- and somewhat lower on the hype scale -- consider the case of Leyden Energy, a 55-employee VC-funded advanced battery startup with actual customers. Since 2010, the firm has shipped more than 100,000 "aftermarket" 18650-format batteries for laptops and consumer portables. The Fremont, California-based firm builds lithium-ion batteries with an electrolyte based around the imide family of salts. The electrolyte is the syrupy liquid (in this case) which carries the charge from anode to cathode in a battery. Most lithium batteries use PF6-based electrolytes, but PF6 can react with water and produce hydroflouric acid which, in time, poisons the anode. Lithium imide (Li-imide™) does not react with water. We spoke with Noam Kedem, the VP of Marketing, who sees the firm "executing on mass production." Leyden's imide science comes via a technology license from DuPont, expanded by Leyden's own core patents. The less volatile Li-imide electrolyte allows temperatures exceeding those of conventional Li-ion cells, longer cycle life, and higher charge density, according to the firm. Kedem claimed that battery manufacturers are "all banging at a 500 to 550 watt-hour-liter energy density limit, but can't break through that ceiling" with a carbon-based anode. Leyden has made strides in silicon anode technology as well -- although the firm has no plans to sell its electrolyte or anode. Instead, it designs, sells and produces batteries using battery-savvy contract manufacturers in China. The battery replacement cycle is fast, getting faster, and must accommodate the increased power requirements of new devices and applications. Kedem notes that "over 10 percent of support calls with smart phones are about battery issues." He added, "What we are seeing today is that the vector of energy density has given way to other functions like swelling and cycle life." Having proven itself in cylindrical batteries, Leyden's 2013 volume market opportunities lie in "pouch" batteries. Pouch batteries swap the 18650 metal enclosure for a flexible, lightweight Li-polymer bag. Standardized pouch cells don't exist -- every device builder gets a custom cell for a specific application. The pouch cells better conform to the package in which they're contained -- be it vehicle, phone, or tablet computer -- but the pouch doesn't have venting holes like the 18650, so the swelling of the pouch has to be accommodated in the device design. Kedem said that "Chinese manufacturers have proven more nimble with pouch cells while the Korean and Japanese have ruled the 18650 -- but they are adjusting to new reality of custom pouch cells." Leyden vies for customers in a fiercely competitive market against giants like LG Chem, Panasonic, Sony, Toyota, Samsung, and ATL, as well as a fleet of VC-funded startups such as Boston-Power, Amprius, Aquion Energy, Envia, Planar Energy, Sakti3, Prieto Battery, QuantumScape and many more. Some of these firms are working on entirely new battery chemistries, or are focusing on anode or cathode materials. The company just formed a relationship with wireless device-charger firm PowerMat, as reported in All Things D, and has raised more than $48 million from Lightspeed Ventures, NEA, Sigma Partners, and Walden International since its founding in 2007. Peter Nieh, a partner at Lightspeed Venture Partners and investor in Leyden, notes that vendors in the "extremely cut-throat" world of consumer electronics have to differentiate to survive -- and superiority in battery performance or lifetime is a huge differentiator -- enough for vendors to be "receptive" and "take on the risk of a new, startup supplier like Leyden." Nieh adds that the drop-in nature of the Leyden technology allows underutilized Chinese factories to partner and lets Leyden trim some manufacturing and cost risks without the "monumental capital" required to build a dedicated factory. Kedem remarked that Leyden was in the enviable position of being "resource-constrained, not opportunity-constrained."